67-year-old country and Western music icon Dolly Parton is being tipped to headline the Glastonbury Sunday Legends slot in next year's event at Worthy Farm in Pilton, Somerset. 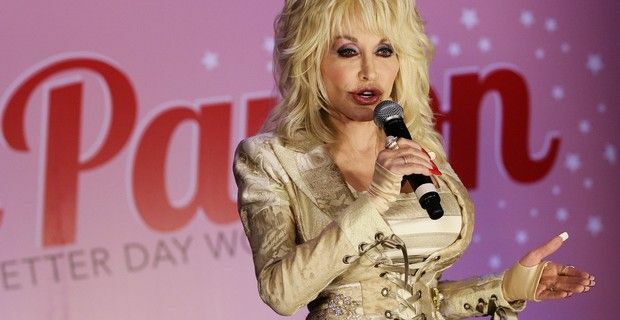 Apparently Parton’s 2014 Blue Smoke World Tour leaves an opening which could see the legendary singer put in an appearance at the famed Glastonbury festival for the very first time. Parton’s UK leg of her tour - with 13 shows scheduled (dates below) – will see her at Cardiff at the Motorpoint Arena 2014 Monday 24th June and then playing London's O2 Arena on June 27, leaving her with open schedule until the Nottingham Arena show on July 2, which further fuels the rumors as Glastonbury 2014 starts on 25 June 2014. "Dolly is perfect for the Sunday Legends slot. It didn't take any convincing - she's always wanted to play Glastonbury," a source told The Sun newspaper. Parton has written more than 4,000 songs in her 45 year long career and has had numerous number one hits including '9 To 5', 'Jolene', and 'I Will Always Love You,' and she is expected to perform a set-list comprising some her greatest hits at the legendary festival. The source added: "It is being kept free deliberately. She'll get a helicopter straight down on Sunday, or maybe even Saturday after the show." Canadian indie rock back Arcade Fire will headline the Pyramid Stage at Glastonbury 2014 on Friday 27th June, and Lily Allen told Radio 1 Breakfast Show in November that she’ll also be performing. Other acts rumored to appear include Daft Punk, Kanye West, Prince and Fleetwood Mac.